On the run from her old flame’s organized crime family, Sara Jones hides in Billings, Montana, and finds a new boyfriend. But when people around her start dying from poisonous spider bites after she receives a mysterious package with a spider concealed inside, she worries that the crime family has found her. Life takes an even more bizarre turn when she seems to be not only immune to the spider venom, but also surrounded by a sinister group of people using spiders to incapacitate their prey. Even her new boyfriend starts acting suspiciously. Just who can she trust? Then to make matters worse Sara’s twenty-fifth birthday approaches, and her dark heritage begins to emerge. She is forced to make a life-or-death decision. And somehow, she must find a way to deal with the crime family. 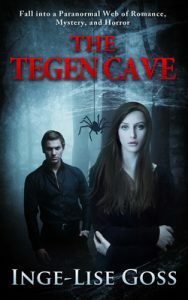 For several months I had thought about writing a paranormal, suspenseful story. I wanted some of the characters to have special deadly needs, similar to vampires, but to be a little more terrifying. Then suddenly it appeared in my dreams. The dreams were so vivid and kept swirling around in my head even when I was awake. I figured my muse played a hand in that. Then I sat down at my computer and the words flowed onto the pages. The protagonist, Sara Jones, came from my dreams. When I started writing the book, it seemed like a movie was streaming through my head and that's where the other characters first appeared. Besides the Tegens, an immortal, dangerous species, I had no idea the book would also involve an organized crime family until they flashed into my head. Feeling someone tugging on my legs, I opened my eyes. Through foggy vision, I saw two women with solemn expressions on their faces pulling me out of bed. I felt dizzy. I tried to talk, but only gibberish came from my mouth. The woman with long black hair put a robe on me. The other one slipped shoes on my feet. I wanted to float away. They held my arms, preventing me from rising. With my feet hovering above the floor, they led me down the stairs and through the house to the backdoor. Were they angels taking me to see Mom and Dad? The black-haired woman put a blindfold over my eyes. Then I heard a door open. They continued holding my arms while I glided between them. A crisp, cool breeze hit my face. The women remained quiet, not saying a word, as we moved along. The rustling of leaves surrounded us. I smelled pine trees. If they’d just let go of me, I could drift to the tree tops. “Bring her here,” a man yelled. My blindfold was removed. I found myself inches from the man with the penetrating, dark eyes I had seen at the hotel. He must have followed me. I felt a convulsion of terror seize my body. I squirmed and wiggled, trying to free myself from the hands that held me firmly. He wouldn’t release me. I gave up. I was trapped. The dark-eyed man held up my trembling hand and placed a spider in my palm. I marveled at the warm, chestnut-brown color with specks of black dribbled through it. I gently touched it. Then the dark-eyed man turned over my hand and tapped it against a metal container. The spider tumbled inside, landing next to three others that looked just like it. He snapped the container lid in place and slipped it into his shirt pocket. He led me through a cluster of cobwebs that clung to my face. He brushed them away and placed my hand on a person. I glanced down and saw spiders crawling on the stout man whose wife had been bitten in the hotel. He was lying on something that looked like a granite table. His eyes were wide open, staring straight ahead. Blood oozed from deep scrapes on his arms. His face was pale and immobile. Was I at his funeral? The dark-eyed man guided me to a chair, sat me down, and held onto my shoulder to stop me from rising above the ground. I opened my mouth to speak. No sound escaped. My eyes darted around looking for Brett; he wasn’t anywhere. He wouldn’t have left me. Something must have happened to him. My heart started beating faster. The dark-eyed man ran his hand up and down my cheek. My heartbeat slowed down. Three people blocked my vision as they moved between me and the stout man on the table. I watched as a slender blond-haired man carrying a knife walked in front of them and passed out of my sight.